How, and where, did wine begin? The search for the answer raises a closely related query; namely, the origin of the grape and specifically Vitis vinifera, the foundation of modern viticulture. 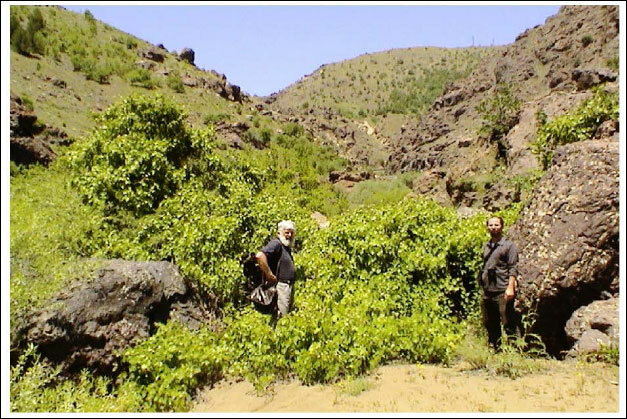 The exploration starts in the upland areas of the Taurus, Caucasus and northern Zagros Mountains in contemporary Turkey, Georgia, Armenia and Iran. From this favorable habitat, the domesticated grapevine and a culture of wine migrated south to Mesopotamia, the Levant and Nile as well as west into the Mediterranean. Vines were also carried east through Persia to China along the Silk Road. As Patrick E. McGovern, a biomolecular archaeologist, observes in Uncorking the Past, there is tangible evidence the earliest alcoholic beverages were being created on both sides of Asia by the early Neolithic period (7000 to 5000 BCE). The very first fermented drinks relied on a myriad of suitable local ingredients including native wild grapes. "Wine did not have to wait to be invented," says British authority Hugh Johnson in Story of Wine: It occurred spontaneously whenever grapes and their juice were collected. The full-fledged production of wine did nonetheless turn on the invention of pottery, traced to around 6000 BCE in the Near East and much earlier in East Asia. "The history of civilization, in many ways, is the history of wine," writes McGovern in Ancient Wine. Historians may focus on dynamic personalities, economic activities, ruling and governing, or wars; yet fermented beverages are a near-constant in human life either ignored or seen as merely incidental. Libations were developed in completely different cultures in disparate places, making the best of indigenous - and sometimes imported - ingredients to achieve the same outcome: a beverage containing a certain amount of alcohol which would enhance spiritual quest, celebration, social interaction and artistic pursuits. The argument McGovern advances is that the demand for alcohol is not simply a cultural preference; it is a fundamental biological drive. He and others label this explanation the "drunken monkey hypothesis" because primates, who are drawn to fermented fruit, continue to eat until they are intoxicated. Joel Butler MW and Randall Heskett, in their remarkable Divine Vintage, take a distinctly biblical perspective as they travel the wine trail from Genesis to modern times. They quote the Bible: "Noah, a man of the soil, was the first to plant a vineyard" (Gen. 9:20). Discoveries in eastern Turkey and northwestern Iran reveal that humans were drinking wine 8,000 years ago, in close proximity to Mount Ararat, said to be the resting place of the ark (Fig.1). The Old and New Testaments, according to Divine Vintage, mention "wine" 280 times, "vine" 49 times, "vineyard" 72 times, and "wine press" 15 times. The Talmud identifies around 70 wine grapes. The authors persuasively make the point that wine in Christianity, Judaism, Dionysian cults - and the ancient world as a whole - "fulfills a social, economic, symbolic and spiritual function." Figure 1. 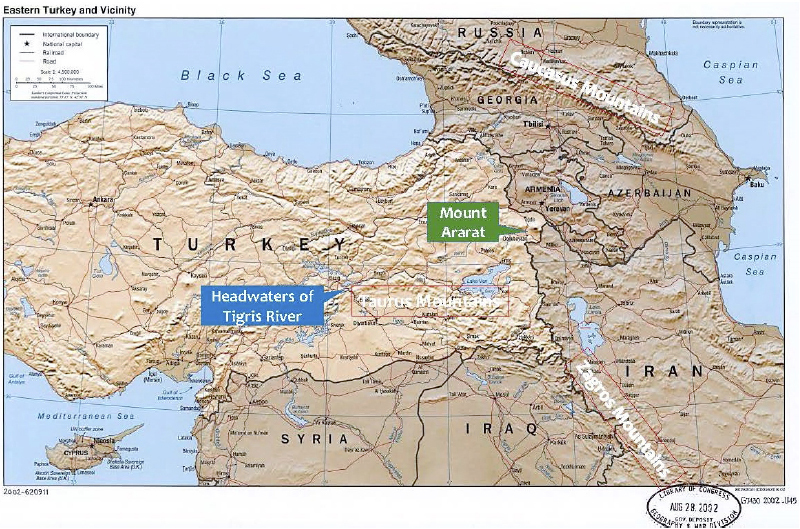 Map of the present-day countries of Transcaucasia and the upper Near East modified by author to show the location of Mount Ararat in eastern Turkey; the Taurus, Caucasus and Zagros Mountains; and the headwaters of the Tigris River pictured in Fig. 2 (Library of Congress, 2002). Whether we see the Noah story as myth or fact, there is considerable evidence that the region around Turkey's Mount Ararat is home to the Eurasian grape species on which we rely for 99% of the wines we drink today. Botanist José Vouillamoz, co-author with Jancis Robinson MW of the extraordinary oeuvre, Wine Grapes, calls this area "Grape's Fertile Triangle." 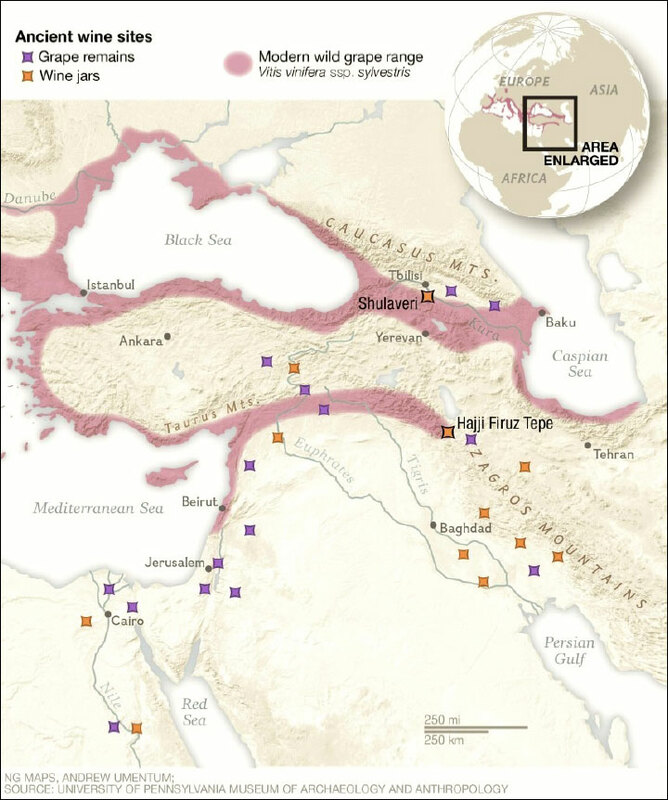 He has pinpointed southeastern Anatolia as the epicenter for the domestication of the grapevine (Fig. 2). It may have taken several millennia for the wild relative, Vitis vinifera ssp. sylvestris, to eventually become Vitis vinifera ssp. vinifera, the domesticated, hermaphroditic subspecies that dominates modern wine growing. Just 60 miles as the crow flies to the east of Ararat in Armenia, a facility equipped with a press and sunken fermentation and storage jars dating from c. 4100 BCE - the earliest-known winery - was discovered in a cave in 2007 (Fig. 3). Its scale of production implies that the grape was domesticated by that time. Remnants of 6,000 year-old vines along with grape seeds and skins confirm the function of the site. Figure 3. 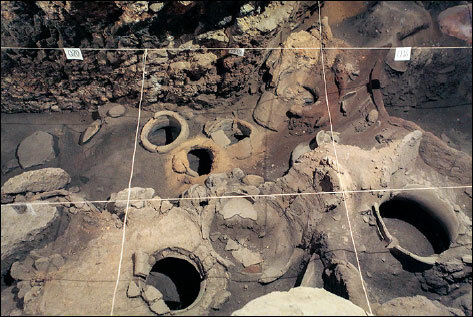 The earliest-known winery, the Areni-1 cave facility in Armenia, 4100 BCE (photo Smithsonian Center for Folklife & Cultural Heritage). Another of the notable archaeological finds to be unearthed is from Hajji Firuz Tepe in present-day Iran, not far south of Mount Ararat and Armenia. An earthenware jar dating from 5400 to 5000 BCE embedded in the floor of a Neolithic house held residues containing tartaric acid - associated with grapes and few other sources - and terebinth tree resin, an oft-used wine preservative in early societies of the Middle East (Fig. 4). Figure 4. 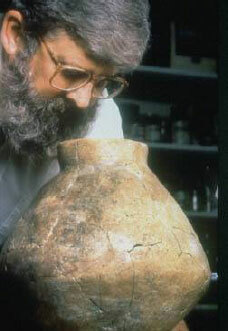 Patrick McGovern inspects the Hajji Firuz Tepe wine jar from Iran (Photo University of Pennsylvania). Figure 5. Archaeologist Mindia Jalabadze with a 6000 BCE jar from Shulaveri, Republic of Georgia (Photo Paul Salopek/National Geographic). 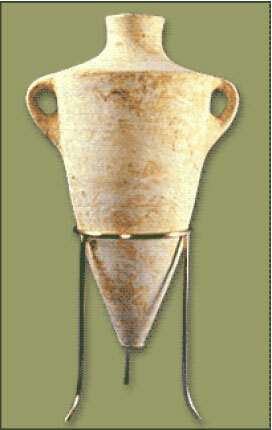 The jar at Hajji Firuz Tepe is one of the earliest confirmations of pure grape wine. 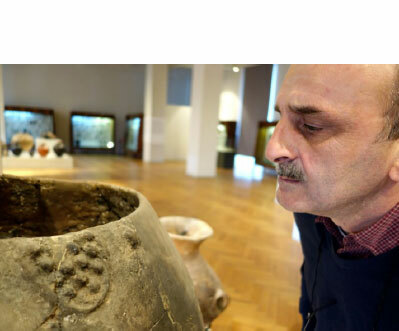 A similar jar decorated with a grape motif and containing traces of tartaric acid, along with grape pips, has been found at Shulaveri in Georgia, just north of Armenia, and dates from c. 6000 BCE (Fig. 5). Georgia proudly claims to have been making wine continuously for 8,000 years. Other archaeological finds marked on the map (Fig. 6) substantiate the spread of winemaking in the ancient Near East. Figure 6. Map of ancient wine sites in Transcaucasia and Near East. The search for the origins of fermented beverages takes us much further east and still further back in time, to China. 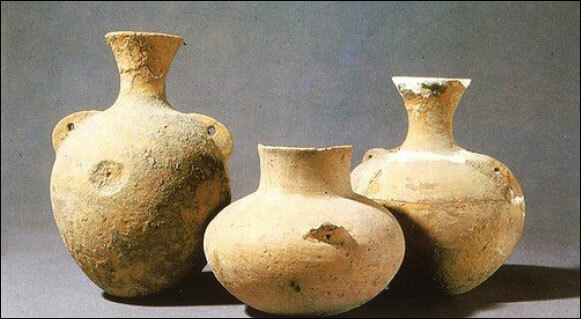 In Henan Province, at Jiahu, pottery jars from 7000 to 6600 BCE were discovered which once contained a fermented liquid; to wit, a multifaceted cocktail consisting of wild grape and hawthorn wine, honey mead and rice beer (Fig. 7). This Neolithic grog - nicknamed Chateau Jiahu by Patrick McGovern - stands as the world's first alcoholic beverage. Figure 7. Pottery jugs containing remains of the world's first alcoholic beverage from Jiahu, China (courtesy of Z Juzhong, University of Science and Technology in China, and Henan Institute of Cultural Relics and Archaeology/Penn Museum). One of the most sophisticated early wine cultures was that of the Hittites, who inhabited Anatolia from around 1600 to 1200 BCE. The phrase so familiar today, "Eat, Drink and be Merry," was coined by Hittite king Šuppiluliuma in the 14th century BCE. In fact, wine was likely part of Anatolian life far earlier. 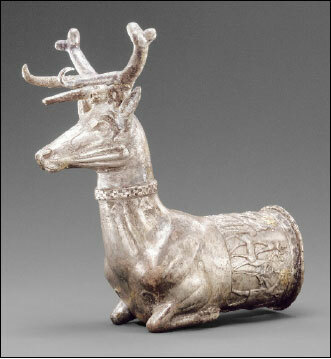 Pottery drinking horns from the late 6th millennium BCE modeled after deer and bulls have been found near Çatal Höyük in Cappadocia, and the designs closely resemble much later Hittite creations. Extraordinary artifacts have been excavated at the Hittite capital, Hattusha - now called Boğazkale - which was surrounded by vineyards. 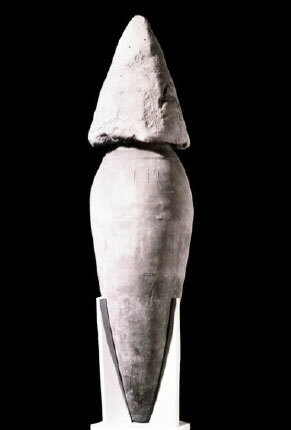 Wine was the preferred beverage at the royal court, and large, bulbous holding jars utilized in many parts of the ancient world (and to this day as the qvevri of Georgia and Armenian karas) have been excavated from Hittite palaces at Hattusha (Fig. 8). Elaborate banquets featured impressive drinking vessels (Fig. 9 & 10), and table service was orchestrated by the equivalent of a modern sommelier. Figure 8. 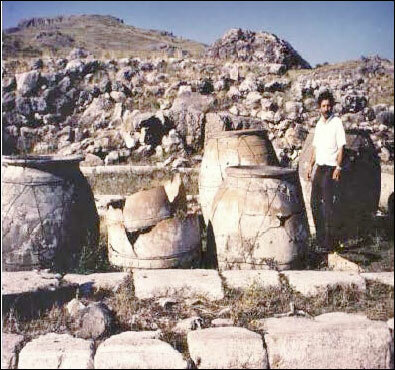 Large wine jars, c. 1400 BCE, excavated from the Hittite palaces at Hattusha. (photo P. McGovern, Ancient Wine, 2003). 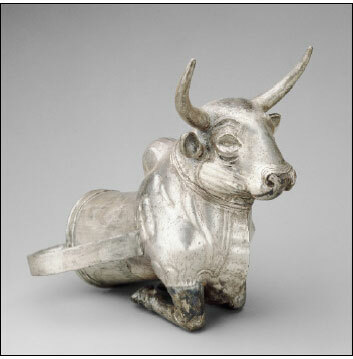 14th - 13th century BCE. (Both photos ©The Metropolitan Museum of Art. The domesticated grapevine, claims McGovern, migrated to the northern Levant in the 6th millennium BCE, southern Canaan two millennia later, and reached Egypt in 3200 BCE. The Egyptians ruled Canaan up to the 13th century BCE. The Canaanites were masterful vintners, and their wines were delivered to Egypt as tribute. Wine jars from Canaan date from as early as the 4th millennium BCE and were found in the tomb of pharaoh Scorpion I (c. 3150 BCE). We know this carrot-shaped container as an amphora, its Greek name (Fig. 11 & 12). The jars were fabricated and modified in size or shape in many parts of the ancient Mediterranean. Amphorae were essentially impermeable and could be tightly sealed; hence they permitted wines to be matured for decades, if desired. Figure 12. Canaanite amphora, 1600-1100 BCE (Athens National Archaeological Museum-Hellenistic Ministry of Culture-ARF). 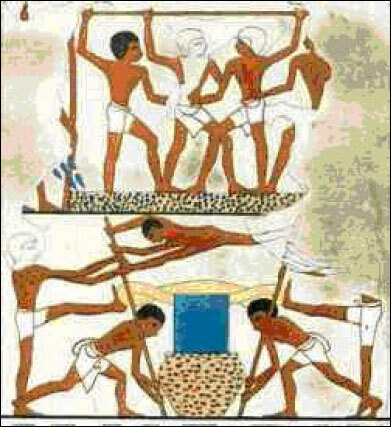 Wine growing in Egypt was greatly influenced by expert Canaanite winemakers. Patrick McGovern writes in Ancient Wine that a "royal winemaking industry was thriving" in Egypt by Dynasty 3, roughly 2700 B.C. The Egyptian hieroglyph signifying grape, vineyard or wine is the very first written character for this purpose. Wine in Egypt was the prerogative of the ruling elites and priests; as in Mesopotamia, beer was the drink of the larger public. We know a great deal about the vinous habits of these ancients because of tomb artefacts and paintings, which tell a detailed story of the period, showing grapevines trained on a trellis or pergola and the way in which grapes were harvested (Fig. 13). There are depictions in tombs of Egyptian officials we would call a vintner's calendar. Murals portray foot treading and a wine press, a muslin sack filled with pomace turned to squeeze out the remaining juice (Fig. 14). Figure 13. Grape vines are trained overhead (right) and trodden by foot (left). The juice is prepared for transfer to Canaanite jars. Tomb of Nakht, c. 1400 BCE. Figure 14. Grapes are trodden in a trough (top), and the pomace is twisted in a cloth sack to extract any remaining juice (lower image). Butler and Heskett speak of the "sophisticated labeling system" for the clay amphorae. Markings referred to the place of origin and the vintage, in terms of the reigning pharaoh, together with identification of the wine itself along with the estate and vintner. Going further, the Egyptians utilized a quality classification, a sort of appellation hierarchy. The wines they drank were mainly red, both dry and sweet. The afterlife "cellar" in Scorpion I's tomb - a staggering 4,500 liters, equal to 6,000 standard bottles - included wines preserved with resin and flavored with herbs such as savory, coriander, mint and thyme. Based on the 30-year old wines found in King Tutankhamun's tomb (c. 1323 BCE), Egyptians evidently also came to prize well-matured vintages. Early Near Eastern civilizations were far from primitive with respect to growing grapes and crafting wine; indeed, the ancients were remarkably accomplished, even artful. "By the time the first glimmerings of a literate humanity had dawned in Mesopotamia and Egypt" in roughly 3000 BCE, McGovern opines in Ancient Wine, "most of the important advances in viniculture had already been made." Our story continues in Part II as we consider the fascinating contributions of Phoenicians, Etruscans, Greeks and Romans, whose influence carries over to the present. ________________. Ancient Wine: The Search for the Origins of Viniculture. Princeton University Press, 2003. Robinson, Jancis et al. Wine Grapes: A Complete Guide to 1,368 Vine Varieties, Including their Origins and Flavours. Penguin Group, 2012.